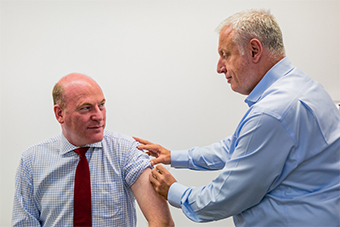 On Fri 27th April, Federal Member for North Sydney Trent Zimmerman MP dropped by the practice of SNPHN Chair and local GP Dr Harry Nespolon for his annual flu shot. This was all a part of the flu vaccination and winter woes campaign currently being rolled out by the Sydney North Health Network. The Turnbull Government have provided two new ground-breaking flu vaccines to over 3 million Australians aged 65 years and over – free of charge. These new vaccines will help provide stronger protection for over 65s in the Northern Sydney area. “More than 90 per cent of the 1,100 flu related deaths in 2017 were by people aged over 65 years of age. This is the Turnbull Government’s direct response to last year’s horrific flu season and is aimed squarely at saving lives.” Mr Zimmerman said. The new vaccines – Fluad® and Fluzone High Dose® – were registered in Australia to specifically provide increased protection for people aged 65 years and older. Since April 2018, both vaccines have been available through the National Immunisation Program following a recommendation from the Pharmaceutical Benefits Advisory Committee. Health Minister Greg Hunt said these new vaccines have been specifically made for the elderly, as their immune systems respond less effectively to vaccines. “These new trivalent (three strain) vaccines work in over 65s by generating a strong immune response and are more effective for this age group in protecting against influenza,” Minister Hunt said.